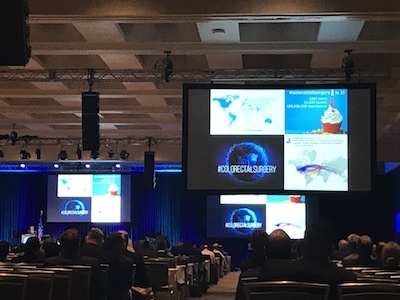 Dr. Richard Brady talks about #colorectalsurgery and Twitter at ASCRS. Social media has already made a big impact for surgeons. To see it for yourself, take a look at the #colorectalsurgery hashtag. According to Dr. Richard Brady, it has seen more than 3,400 users and 31,000 tweets in its first year. Or take a look at the #Ilooklikeasurgeon hashtag, which started in August 2015 and is still going strong. Tweets get especially fun during academic meetings and congresses. By using hashtags like #ACSCC16, #ACPGBI2017, and #ASCRS17, you can easily engage with fellow attendees or follow the event from home. These event hashtags seem to be growing. According to this tweet by Dr. Sean Langenfeld, the #ASCRS17 hashtag was tweeted 6,723 times this year. In 2015, the #ASCRS15 hashtag was only tweeted 944 times. Share clinical data, said Dr. Des Winter (@des_winter). Manage your reputation, said Dr. Sean Langenfeld (@seanlangenfeld). Take some breaks, said Dr. Richard Brady (@researchactive). If you have any more thoughts on this, let us know. Tweet us at @CookSurgery.